I did not purchase tickets in advance. So, I had to wait in line to buy tickets. The twins have very little no patience. They would not wait in line. They ran into the Children’s Museum area of the JCC and would not leave. Two hours later I realized, I needed to start wrapping things up so I could go home and feed Sawyer. One twin proceeded to behave completely inappropriately in public while the other twin had a near blow out of his diaper. I needed to get us all to the bathroom asap. Neither of the twins would go willingly. I had to drag them kicking and screaming to the bathroom. Finally, I wrestled one down long enough to change the diaper. Blow out averted. I still am not sure how but I got the twins into the car. Before strapping them into their car seats I called Evan. Through my tears I told him that I was driving home with the twins and passing them off. And, I did. Evan met me in the garage holding Sawyer. I took Sawyer and went to feed him. Evan worked some sort of magic and got the twins down for a nap. 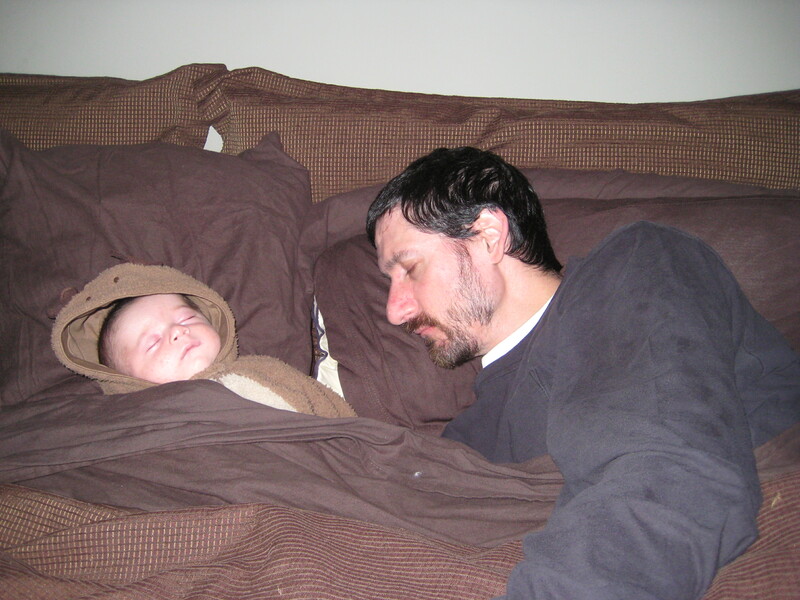 Then he and Sawyer decided to take a nap too. I was still recovering from my big morning out with the twins but I was so excited that the night nurse was coming that night. I knew I would be able to sleep soon enough. So, while everyone was sleeping I did laundry, dishes, wrote thank you notes and took this picture. I did not know then that it would be the last picture taken of Sawyer. I remember those days (and nights) of temper tantrums (theirs and mine); meltdowns and no sleep. They now seem like a lifetime ago and what I wouldn’t do to get them back! Oh if only we had a rewind button for life! I too have a “last” picture that I didn’t know would be the last picture I took of my love. Sometimes it makes me sad to look at it, other times I smile at remembering the moment. Blessings to us both as we remember what was, what never will be and what our futures hold. Dear Lanie – You tell Sawyer’s story so lovingly even while you write of sleep deprivation and difficult behavior on the part of the twins. I hope and wish that putting all the events on paper, you relive and re-endow them with permanence. It is heart-rending to read all your story and I admire the strength you have to retell it. May you all have a very fine 2011, with good health all around and much joy. That picture is worth millions — the beautiful result of the tag team effort put in by you and Evan. It’s unfair and inconceivable that it had to be the last. The picture is amazing. A beautiful boy. What a beautiful picture- I never saw that one. I’m so glad that you have it. Sawyer (and Evan) look so peaceful and content. It is a nice way to remember Sawyer’s short time with you. It’s amazing how you’ve managed to find a moment of levity in a bigger moment of darkness. That’s a blessing in itself. I love the picture, as I hadn’t seen it before. I have just found your blog… Beautiful beyond words– May you find peace.